When you think of Pittsburgh, PA, the first industry likely to spring to mind is steel industry and then manufacturing. It didn’t earn the moniker of The Steel City for nothing but in the latter half of the 20th century, the city began to experience a massive shift in its economy towards areas like healthcare, hospitality, and education. After the decline of the steel industry since the ‘80s, there has been a great deal of diversification into these newer industries. In 2009, the New York Times profiled how a number of former steel workers had left the industry and moved into medical services and devices. It was shifts like these that have given rise to new economies in Pennsylvania’s second city but the local business community wants more - to foster growth in technology startups. It’s a recurring theme across America, and indeed the world, where a city wants to become a Silicon Valley clone but with its own identity. New York has its Silicon Alley, the Pacific Northwest has the Silicon Forest, Iowa has adopted the Silicon Prairie title and Pittsburgh wants to be the Silicon Strip, at least according to the Pittsburgh Downtown Partnership. The organisation, which promotes tourism and business in the city, has teamed up with a number of property developers to kick around the idea of developing this new image for Pittsburgh. In their view, the initiative would be an actual physical strip in the city, stretching from the Strip District downtown to the Oakland neighbourhood in the east. The idea was born from frustration with Pittsburgh’s lingering ties to its steel past and its “rust”, says Aaron Stauber, president of Rugby Realty. “Let’s sweep away the rust and instead have silicon,” he told the Pittsburgh Post-Gazette. Changing a long held reputation of a city is no easy task and slapping a name like the Silicon Strip on something might look good on marketing material but Pittsburgh will need the involvement of the tech companies that make something like this possible. Thankfully for Pittsburgh, it is a city that has been steadily producing successful startups for a number of years even if some of them have flown under the radar. Amazon is just one tech giant that has clearly been keeping an eye on the city, making two acquisitions this year. In September it picked up Safaba, which developed automated translation services and counted Dell and PayPal among its clients. No financials were disclosed. Meanwhile in April, it also scooped up Pittsburgh’s Shoefitr, which has spent five years creating imaging technology for measuring and buying footwear online. Again, details of the deal haven’t been made public. Shoefitr and Safaba have one other thing in common; they were both founded by graduates and/or professors from Pittsburgh’s Carnegie Mellon University, an institution that is frequently at the forefront of tech R&D. The university claims it has produced around 1,000 startups from healthcare to robotics to energy and holds regular events like LaunchCMU that show off Pittsburgh’s startup pedigree and hopes to attract investment into the city. Some of these startups have gone on to become big names like Duolingo. The language learning platform was co-founded by CMU professor Luis Von Ahn, who had previously sold reCAPTCHA to Google. Duolingo remains headquartered in Pittsburgh and in its most recent funding round in June raised $45 million while the app has partnered with ride-sharing giant Uber to provide help certifying English-speaking drivers in Latin America. Uber itself has seen the benefits of Pittsburgh and Carnegie Mellon too. The company has taken up residence in the city for its advanced robotics centre. Josh Knauer, CEO of Rhiza, a long-time member of Pittsburgh’s business community, thinks the city is a great place to do business. The several universities in and around the city provide a pool of talented graduates while he’s keen to point out the low cost of living, especially when compared with San Francisco. But he has reservations about trying to replicate Silicon Valley. The city has its own strengths, which it needs to play to rather than trying to be a smaller version of Silicon Valley, he says. Instead the city has seen a small tight business community grow by itself naturally, led by the private sector, he adds. “These initiatives that have grown the tech sector in Pittsburgh have not been government programs. These have happened because of the university environment mixing with the companies in the region, fostering that sense of growth,” he says. At the same time, there are some bumps in the road, according to Bobby Zappala, a former lawyer that heads up the Thrill Mill early stage accelerator in the city, which provides support and small funding for young “idea stage” companies. Accelerators like his or AlphaLab provide platforms to start but the follow up stages remain a challenge. The city’s mayor Bill Peduto hasn’t endorsed the Silicon Strip idea, saying there needs to be more community consultation. “Mayor Peduto thinks it is an interesting idea, but believes Pittsburgh City Council and other community stakeholders should give it study before the city can officially sign on,” a spokesperson told IDG Connect. However the city recently published its Roadmap for Inclusive Innovation program, a manifesto that lays out how the city will grow and foster young businesses, equality, and efforts like open city data. 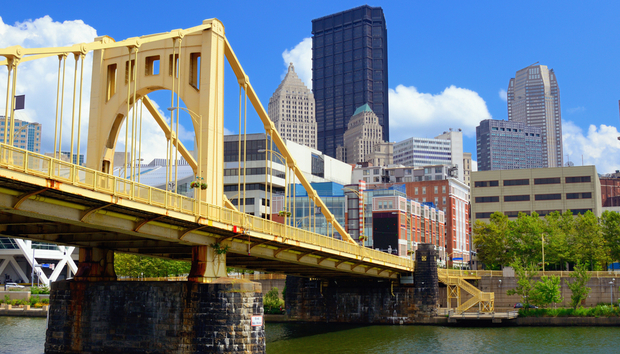 The program involved a lot of community outreach as well as comparison studies with other cities, Debra Lam, chief innovation and performance office for the city of Pittsburgh, explains to IDG Connect. The current relationship between the city government and the local business community is changing for the better, according to both Kanauer and Zappala. Peduto has been in office for nearly two years and now is when the city needs to start acting on those talks, says Zappala. The Roadmap for Inclusive Innovation is the city’s “living document” for making this happen and opening up business and innovation to more and more people, says Lam.